Best Supporting Actress, Wide Open or Not? Is this year’s Supporting Actress race wide open or not? 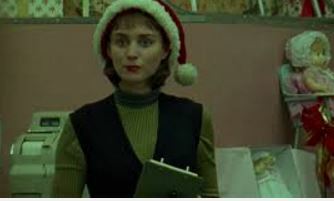 I think the HFPA(Hollywood Foreign Press Association) who give out the Golden Globs, er, I mean, GLOBES, dynamited both the Best Actress race and the Best Supporting Actress races, by insisting that Rooney Mara for “Carol” and Swedish actress Alicia Vikander of “The Danish Girl” MUST be considered in lead. I would never have thought that yesterday. I had to see it to believe it. I mean, Mara did win Best Actress in Cannes, which I guess in this day and race really means nothing. And since Best Actress is incredibly jammed already, there just may not be room for Mara AND Blanchett, and/or for Mara and Vikander, who gives a truly transcendent performance as the conflicted wife of a transitioning transgender man-to-woman in “The Danish Girl,” played brilliantly by probable nominee for Best Actor, and last year’s winner, Eddie Redmayne. So who is going to fill up the now empty Best Supporting Actress race? 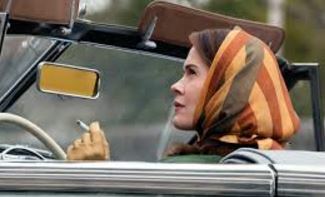 Well, as I said before, I would love it if Sarah Paulson (above top picture) got nominated for “Carol.” Since the HFPA’s Edict of Nantes, they CAN’T nominate Rooney,in Supporting, they might just go far Paulson’s steely Best Friend and ex-lover of Carol. That would be great and people WILL get to see “Carol”. And see Paulson in it and how good she is. Paulson was pretty stellar in “Twelve Years a Slave” wherein she horrified voters as the vicious slave-owners wife, who throws a glass decanter in future Oscar winner Lupita N’yongo’s face, scarring her for life. And then there’s room for probable nominee screen legend Jane Fonda getting in for a five minute scene in “Youth.” I bet they are going to nominate her sight unseen because she is well, Jane Fonda. I keep banging the drums for Parker Posey in Woody Allen’s “Irrational Man,” but no one seems to be listening to me. Posey has another juicy role coming up next year in Woody’s next opus. Maybe the Academy will wait for that role before they get on the Parker-Posey-is-now-legit(to us)-train. I’ve mentioned before two look-alike blondes Elizabeth Banks and Rachel McAdams in, respectively, “Love and Mercy” and “Spotlight,” the front-runner at the moment for Best Picture. Both blonde beauties may have been pushed further inside the race than they ever might have been otherwise by the HFPA’s ruling on Mara and Vikander. 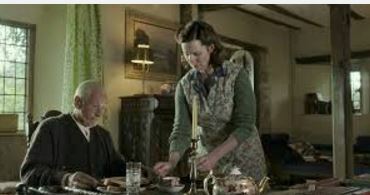 And let’s not overlook the wonderful Oscar perennial Laura Linney, who really holds Ian McKellan’s house and home(and picture) together as the put-upon drudge of a housekeeper in “Mr. Holmes.” If the voters view “Mr. H.” to see Sir Ian’s great nonogenarian detective, they’ll see how beautiful Linney’s work is opposite him. I thought people would forget this charming film and McKellan’s and Linney’s lovely work in it, but it seems they’re not. And last but not least, you can never count out Dame Helen Mirren’s campier-than-thou take on the late real life gossip columnist Hedda Hopper in “Trumbo,.” who underneath her elaborate headgear was a ruthless red=baiter. There’s nothing like a Dame as the ole saying goes. A rubric that AMPAS lives by. They’ve always have got to get a “sir” or a “dame” in there somewhere to give the evening class. Have I left anyone out? Probably. But I’ll catch you up on these magnificent ladies on the flip side. It’s Oscar Hallowe’en! Boo! Did I scare you? Not as much as some of the box-office news is scary for some of the Oscar Wannabee Contenders. “Steve Jobs” has just about died at the Box-Office. Michael Fassbender in the title role might not even get nominated! As I said before about “The Joy of Typing”(my title for “The Social Network”) who in the Academy wants to see a movie about the Internet? NO ONE. Some Academy members don’t even HAVE a computer. You have to call them on the antiquated machine known as the telephone. Or worse, WRITE THEM A LETTER. Some don’t even have email. Also sinking like a stone at the B.O. is, sadly, “Suffragette.” Women will love this movie. Men will hate it and the Academy as I’ve always said is made up of the SWORM. The Straight White Old Rich Men, who dominate Hollywood(and the Oscars) since the dawn of time. They’re gonna hate it, since there is NOT ONE sympathetic male in the entire movie. And “Suffragette”s lack of relatability (to men) will sink it at the Oscars and Carrie Mulligan’s very good performance, too. Perhaps…Sad for Carrie. But good news for Saoirse Ronan in “Brooklyn.” “Suffragette’s lose, may be the charming, small period film’s gain. “Brooklyn” I mean. As Brit Carrie goes down with her ship, Irish Saorise will rise with hers as the token femme Celt. A film that is also going to scare all the other contenders is the upcoming “Joy”. With Jennifer Lawrence once again being up for Best Actress for her role as a house-wife who turns into a mega-businesswoman. A single mom, at that. And if you can find it(it’s not hard. It’s everywhere now. )on the Internet, the trailer REALLY looks great for Jennifer to perhaps do it again and win a SECOND Best Actress Oscar. She’s a star. She’s under 25. She’s box-office. It’s David O. Russell-directed(again) and it’s going to be her v. Brie Larson in “Room.” You mark my words.And strangely Brie Larson’s character is ALSO named Joy. So it’ll be Joy v. Joy at the Oscars this year in the first time in AGES since we’ve really had a race going on in that category.And that IS a joy! Cate Blanchett’s excellent “Truth” is also tanking at the box-office so she’ll probably be nominated for her other upcoming film “Carol.” But having won so recently for “Blue Jasmine,” I don’t think they’ll give her a third Oscar this year, though Jennifer Lawrence very well may be looking at her second. Also looking straight at a second Oscar is Eddie Redmayne in “The Danish Girl”. Based on a true story(see above^) and featured magnificently in VOGUE with Lupita N’yongo on the cover with a spread that shows his remarkable transition. 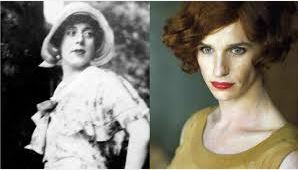 Lili Elbe one of the first, if not THEE first transgender pioneer, is such a tragic figure. It may also tug at the Academy’s hard heart. I think it will. Eddie makes a beautiful girl. His performance as Lili is nothing short of incredible. He’s even better than he was in “The Theory of Everything” which he won Best Actor for last year. NOT scaring anyone is Johnny Depp’s “Black Mass” another mis-fire. People admire his performance as Whitey Bulger, a mob informant/killer (Haven’t we seen him in this role before?Wasn’t it called “Donny Brasco”?) Critics like HIM, but not the movie and It’s not scaring up much $ either. Though “The Martian” is! And that could be our Best Picture winner, BTW. And could garner Matt Damon a nomination as Best Actor.THAT is the red elephant in the room. Also, everyone is afraid that it just may be Leonardo DiCaprio’s Oscar year FINALLY. But “The Revenant” is still to be seen. I didn’t think it would be ready in time, but it looks like it is. Will the public embrace it more than “The Martian”? Hard to say. And Ridley Scott, “The Martian”s director has never won an Oscar, though his film “Gladiator” did. So BOO! And Happy Hallowe’en, dear readers, dear cineastes! I’m BAAAAAAAAAAAAAAAAACK!!!! More “Grand Budapest Hotel” Hijinks wth WIllem Dafoe & Jeff Goldblum! The absolutely grand “Grand Budapest Hotel” opened today and the hijinks couldn’t get much higher with co-stars Willem Dafoe(the bad guy) & Jeff Goldblum(one of the many good guys.) A genuine mad cap, screwball comedy with REAL madness and more than a few screwballs in it. It’s to die for. These guys are more fun than a barrel of Marx Brothers!